Atomic Cool™ | Official Site | Get Cool Air Where And When You Need It! Atomic Cool™ cools you down in minutes and is easy to use! you can easily take Atomic Cool™ room to room, or carry along when you travel! Blistering summer heat can be extremely uncomfortable and dangerous to your health. Introducing Atomic Cool™ the innovative powerful and ultra-portable personal cooling system that gives you cool air when and where you need it! READ FULL DESCRIPTION Atomic Cool™ utilizes evaporative water filters that use H2O cool fusion technology. It pulls in hot, stale dry air and converts it to cool, moist air to keep you cool. This type of tech was originally invented as a way to stay cool in the desert heat! Atomic Cool™ can be powered by your power outlet. Plug it in at home or the office, or employ the battery operation during camping trips. You can even use Atomic Cool™ during power outages! 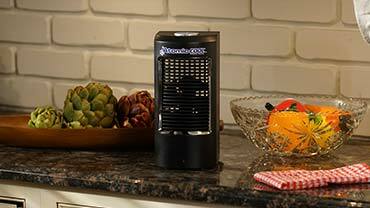 Take control of cooling your air. The digital thermostat gives you precise control over your room temperature. Typical air conditioners are expensive and bulky. Atomic Cool™ costs a fraction of the price and is so lightweight that you can carry it from room to room. It's great for using in bedrooms, daily bathroom routines, work areas, and even at the office. Atomic Cool™ is so portable you can travel with it. What an ingenious way to keep cool in a hot kitchen! Atomic Cool™ cools up to 50 square feet, making it ideal for dorms and RVs. Regular fans blow hot air. Air conditioners are expensive and heavy. Cool down fast and easy with Atomic Cool™! Get your Atomic Cool™ for only $39.99 plus $9.99 shipping and handling. But wait - we'll double your offer so you'll receive a second Atomic Cool™. Just pay a separate fee of $19.99. Hurry because deals this hot won't last long! Atomic Cool™ is a powerful, ultra-Portable personal cooling system. Uses h20 Cool fusion technology originally invented as a way to stay cool in the desert. use the digital thermostat for precise control for a temperature that's just right! Power your Atomic Cool™ by using your normal outlet. Check out these other great products by Atomic Cool.